I sit down on a tiny stool beside Molly the cow, grasp one of her teats, and tug. Nothing happens. I try again. On the fourth try, a squirt of milk arches toward the front of my 19th century dress. Farmer Bill Schotanus, who is squatting beside me, laughs. “Now if we could get you to aim into the bucket,” he says. Apparently, I’m not smarter than the 9 to 16 year olds who come here to Kings Landing Historical Settlement each summer to get immersed in nineteenth century New Brunswick. 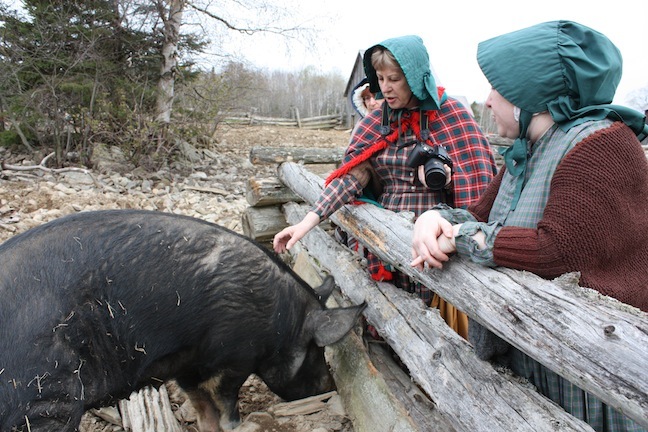 The village is an outdoor living history museum a 20-minute drive west of Fredericton. The 67 buildings depict the evolution of rural life in central New Brunswick from the late 18th century to the early 20th century. They were moved onto the site in the 1960s when the Mactaquac Hydroelectric Dam project, which would raise the St. John River’s water level by more than 150 feet, began. 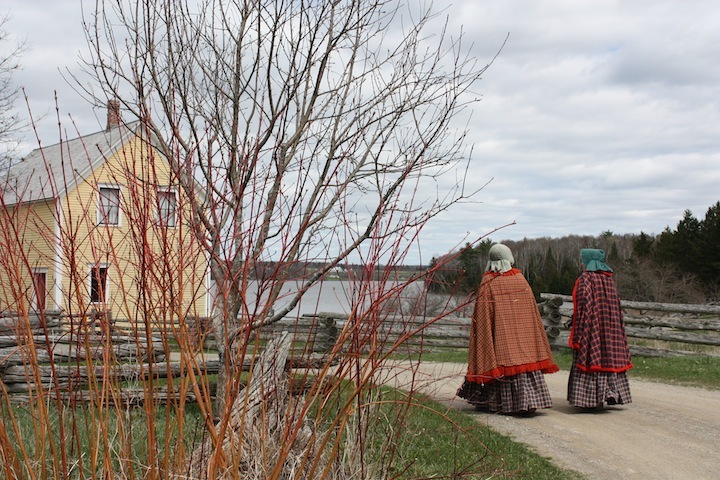 During the five-day Visiting Cousins and Family Kin programs, participants dress in period costume and live as young people did in the 1800s. They act as relatives to Kings Landing families and participate in such 19th century activities as butter making, cooking, spinning wool, work with the blacksmith, cooper, carpenter, sawyer, and farmer. They also attend the 1840 one-room schoolhouse every day. Graduates of the program who are 12-16 years old can sign up for the Family Kin program that allows them to focus on one trade and learn to be young apprentices. 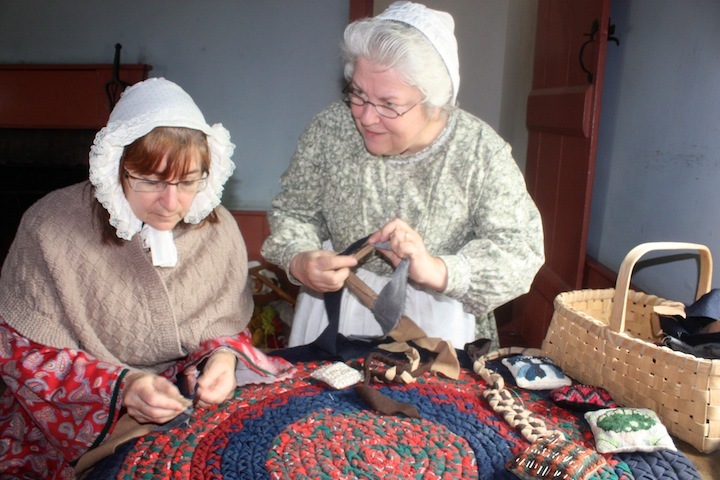 I try different activities including wool processing, rug hooking, and braiding. But it’s farming that really captures my attention. Kings Landing’s farm has about half a dozen horses, three pigs, sheep and lambs, cows, two oxen, and a host of chickens. How do my skills as a first-generation alpaca farmer in the Northwest Territories stack up against a more diverse 19th century operation in rural New Brunswick? On my fourth tug of one of Molly’s teats, a small stream of milk lands in the grey metal bucket. But the cow knows that I’m an amateur – and she’s getting impatient. She starts shifting her weight around, so Schotanus takes over. I’m not about to argue with a bovine that’s more than ten times my size. Milk flows steadily under the farmer’s experienced hands. A little voice in my head wonders when the remedial class gets underway. Then I head to the Perley House to make butter. Mrs. Perley lets the cream rise to the top and skims it off using a colander. She pours the two quarts into the churn, a small white barrel shaped like a mason jar. It rests on a square wooden platform raised a few inches off the floor. I clutch the four-foot long wooden stick (called a dash) with both hands and thump it up and down to beat the cream into submission. At first the cream sloshes around inside the barrel. Then it hardens. “It has to slosh around again,” Mrs. Perley says as she watches me. The cream needs to separate from the buttermilk. Slosh to no slosh and then back to slosh again. Got it. Sort of. It’s taking a long time for the cream to separate. My skinny little arms don’t seem to have quite enough muscle to perform the task. “Churn, butter, churn!” Mrs. Perley sings as she takes over from my aching arms. Suddenly, the cream and buttermilk agree to part ways. “Yes, we’re getting better!” she says raising her arms in victory. 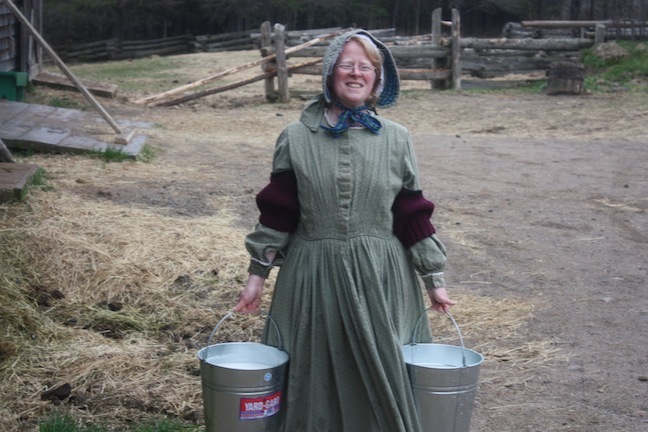 Mrs. Perley carries the churn into the kitchen and pours the butter onto a tray. She shows me how to ladle water over the butter and use a wooden paddle to remove any remaining buttermilk to prevent the butter from souring more quickly. This repetitive task is meditative as I stand beside a window that looks out onto the village and its dirt roads. I head back to the farm in late afternoon to continue my apprenticeship and help the farmer feed the animals. At least I’ve had some practice hoofing hay to our alpacas’ feeder and dropping pellets into their troughs while they jockey for position around me. Standing inside the middle of the barn at Kings Landing, Schotanus hands me a tin of feed the size of a coffee can. He gestures toward several hay bales lined up in a row. I stuff some hay inside each horse and sheep’s pen and empty the contents of the can into the feed troughs while he milks Molly. I grab two buckets of milk and carry them to the pigs’ pens. The 19th and 21st centuries have an impromptu meeting as the camera resting against the chest of my period dress plops awkwardly into one of the buckets when I lean over. I rescue it – and look around to make sure Schotanus hasn’t noticed. If he has, he’s enough of a gentleman not to say. As we walk back into the barn, I can see Jack’s snout poking over the top of the pen. The skinny pig knows that dinner has arrived – and he’s beside himself with excitement. He gets in the way as I try to pour feed into his trough. “I think I just dropped some feed on his head,” I confess to Schotanus. “It don’t matter he be wearin’ it,” he replies in a relaxed tone. I can’t tell whether he’s given up on my ability to perform any chore properly – or if he’s used to the incompetence of newbie farmers. Perhaps I should stick to alpaca farming. At least that doesn’t involve any milking.